What is the GVCA and why should you care? The GVCA, also known as the Green Valley Civic Association, was founded in 1960 as a not-for-profit civic organization by neighbors living in Valle Verde and Green Valley. At that time, the area was an unincorporated community in the County of San Diego and the group sought to ensure better representation at the County level on big decisions affecting quality of life in north Poway. Over time, the GVCA became a major voice in how this area of Poway was developed and its leaders were instrumental in Poway incorporating as a city in 1980.
fee increases for landscape maintenance districts (LMDs) along Espola Road. To provide accurate and informative reviews of these ballot measures, the GVCA has met and discussed them with city staff, council members, consultants, community members and the owners/ developers. While these recent ballot measures did not gain the public supportneeded to pass, the proponents areevolving their plans and the GVCA will be there to examine and evaluate the future proposals and keep our members informed. Our board of directors is comprised of seven volunteer members–all active and long-time members of the Poway community. (See our website for bios www.gvca.info). Excess funds are returned to the Poway community through donations supporting performances pre-sented by Poway OnStage at the Poway Center for the Performing Arts, Poway High’s “Grad Nite,” and most recently the Abraxas High School gardens project (see next page), and other local activities, events and groups. Now is the perfect time. This letter kicks off our 2019 membership campaign. Your generous membership dollars help financially support our mission, our ongoing communications, and community giving. We are not a homeowners association and your membership is completely optional. Our hope is that you find the mission and work of the GVCA to be of great value and that you join/renew to be part of an important organization. Newmembers join for FREE the first year. Together with your voice, your support, your civic action, we can effectively address issues impacting north Poway, and also serve as a positive force for local youth and activities, and more, in the community. We look forward to serving you as a 2019 member! GVCA is proud to support a unique and worthy program at Abraxas High School: the Abraxas Garden located on the school’s former tennis courts on Pomerado Road. Developed as a way to incorporate core curriculum in a student-led, hands-on learning environment, the Abraxas Garden won 2 National Gardening Awards in 2018: One for Community Beautification and the other was the Kellogg Civic Achievement Award. The Garden alsowon 1st Place in California for the Community Impact Award. Since the Gardens began, over 5,000 lbs. of fresh produce grown at the garden has been donated to families in need in the community. They also have started a Farmers Market to raise money to keep the Garden running. The Farmers Market is open the first Wednesday of every month at Elements Café at the Poway Unified District Office. The market is supported by donations in which visitors ‘pay what you can’ and all proceeds go directly back into the garden for seeds, fish food, and other needs that arise. Under the leadership of Bob Lutticken, Biology, Aquaponics & Agriculture teacher at Abraxas, students just completed a solar powered vertical herb garden (pictured here) which was made possible through a grant from the GVCA. The Abraxas Garden is run through classroom curriculum, and over 100 students work in the garden throughout the school year including our Transition Program which includes students with special needs. 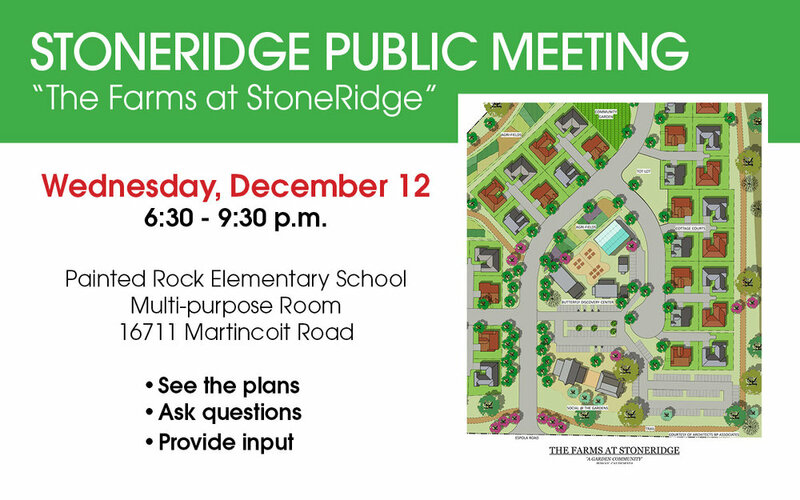 Important public meeting about "The Farms at StoneRidge"
Learn more about the proposed development of the former StoneRidge Country Club. Local real estate investor, Kevin McNamara, is hosting a public meeting for the community to learn more about the project his company is proposing. The GVCA has not taken a position on this proposed development and is providing this information to keep you informed. We asked the candidates some “Pre-Forum” questions prior to the upcoming forum. Please click the ORANGE buttons below to read the Pre-Forum Q&A. PLEASE NOTE: The GVCA does not endorse or oppose any proposal at this time. We are providing this information to the community to keep you informed and to encourage your constructive input and comments. Any change in land use from the current OS-R zoning of this property will require a public vote known as Prop FF. As a preface to our comments, I want to stress that this is just our first draft of a plan. We are continuing to try and improve it. For example, the access to houses off of Cloudcroft Ct was an oversight and is currently being adjusted. The homes will be accessed internally from the beer garden area. We are looking for input from the community and encourage you to send us your comments, ideas, or criticisms to YourPoway@gmail.com. I answer all the emails. Why did you decide to pursue development at SRCC at this time and so soon after the previous ballot measure failed? Stoneridge has become an uninhabitable building, often vandalized, surrounded by a deteriorating vacant lot. The trees are dying and the future condition of the land is hopeless unless something is done. It is a fenced in property with no connectivity to any other open space or natural habitat that will never be a functional property for Poway residents unless we do something. I’d like Poway to determine its own fate. I feel that I have a singular resume to get something of quality accomplished and I enjoy challenges. After the election I felt the opportunity was there if a local person pursued a true vision that is reflective of Poway. What experience do you have in this type of development? We’ve assembled a team of long time land and entitlement experts; including local Poway architect Roger Basinger. We will also retain an agricultural expert as part of the team as we are looking at this project as an “Agrihood”. I was Planning Board Chair in Penasquitos for a number of years in the late 80’s and early 90’s, and we were responsible for negotiating a large number of development agreements in the City and County. 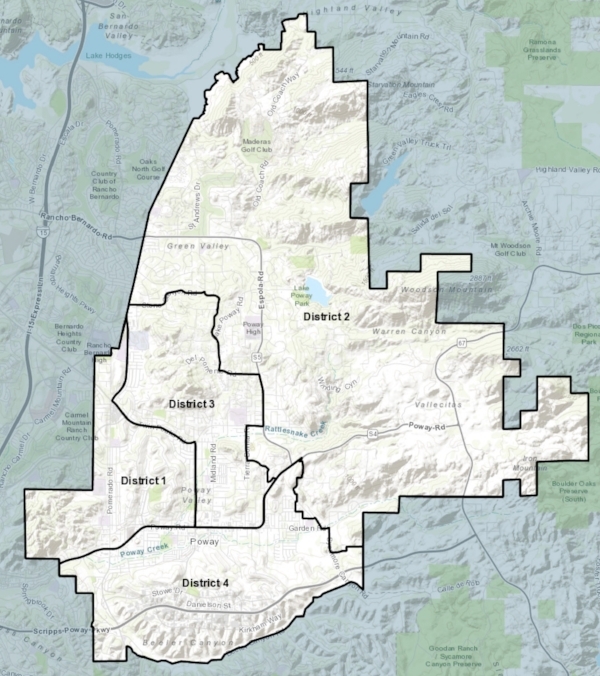 These included the 12,000 acre Future Urbanizing Area, 4S Ranch, SR 56, and the Black Mountain Open Space Park. I learned quite a bit and feel that we were quite effective and represented the community well. I started in real estate in 1974 so I’ve been around for a while. Why do you think the community would support rezoning the property to something other than the current Open Space-Recreational (OS-R)? Poway voters are smart. If the property was to retain the OS-R designation under the current ownership, it would sit fallow and no enhancements or beautification could be anticipated onsite. Under our proposal a Specific Plan would, very unambiguously, land plan the property with a variety of wonderful amenities for use by all Poway residents. If a high quality project with community appropriate density and product type with public amenities and permanent open space goes through the entire planning process, which has never been done prior to a Prop FF vote, why wouldn’t there be strong support? If the project is approved, Poway residents will once again have full use of the property. How many and what types of housing units will be proposed? We are planning approximately 162 homes to help serve empty nesters, young families, and residents that want to be part of an agrihood development. We are also proposing an approximate 100 ft. buffer between existing homes and any new development. Our concept is unique and will be a wonderful addition to Poway We are still in the early stages but we are looking at farm-style single family detached and twin homes to help stay in character with the surrounding community. What commercial and/or public uses will be proposed? The proposed project is full of amenities for all Poway residents. There will be thoughtfully designed community gathering spots. The proposed design includes several ponds, pocket parks, community gardens, all connected through a series of trails. A proposed four acre Swim and Racquet Club as well as a beer, wine, and coffee garden. We are working on including potential vineyards, hops, and/or flower growing operations. As well as a traditional country barn built as a community center and a new clubhouse to highlight Poway character. In addition to all of this we are proposing a Butterfly Vivarium which brings a unique quiet beauty to the project. All of this will be processed under a Specific Plan which will prevent deviations from whatever City Council approves - that includes preventing any increase to density or intensity of use. Will a golf course, tennis courts, pool and/or clubhouse be part of the proposed plan? If not, why not? We are planning a new Swim & Racquet Club with a clubhouse which would be available with a membership or fee to the public. We are looking at 5 new lighted tennis courts, 4 new paddle tennis courts, and 2 swimming pools with one being a 25 yard 4 lane pool lap pool and the other a family pool. There will not be a golf course. The CUP that Stoneridge operated under was automatically terminated six months after the gates were closed. Golf is not financeable or profitable anymore. We’ve talked with four different golf consultants and the unanimous opinion is that there is no chance for success. How would the proposed development be similar to the "Agritopia" development in Gilbert, AZ? We are planning several community gardens, private gardens, a huge picnic area, as well as some professional agriculture cultivation. It will be a great place for empty nesters or young families to live. Agritopia is a great project. It is a model of how an agrihood can work. We are trying to enhance that model with additional amenities available to all Poway Residents. How will Poway residents benefit from rezoning the property to the proposed development? There will be absolute certainty on what will happen. The property will be enhanced and not left fallow. The City Council will, hopefully, work with us to approve the project and then the voters will have their say. There will be no empty promises. The project will be set in stone per Council Approvals and the associated Specific Plan, so voters will know exactly what they are voting to approve. The proposed amenities in addition to, the neighborhood Beer, Wine, Coffee Garden and available memberships to the Swim & Tennis Club will include several ponds, a 4+ acre butterfly farm, a potential greenhouse area for the garden clubs, a possible 1.5 acre permanent home for the Poway 4H, open space and agricultural areas that will be dedicated as permanent open space, hiking and biking, horse trails, the barn as a community center and all of this available to the public. How will you gather and incorporate input on the development concept? We have had a few neighborhood meetings so far. We’ve postponed quite a few more until we get the housing defined so we have at least a more refined project to discuss. We’ll try and have as many neighborhood meetings throughout the city as possible. Anybody who wants to meet with us can just email us at YourPoway@gmail.com and we’ll schedule something. After we submit our plans to the city then the city will host a number of public workshops. This campaign will be as grass roots as it gets. Regardless of the Environmental Impact Report (EIR) results, how would you mitigate impact on schools, water/sewer usage, traffic, noise, etc.? I can’t answer this yet. We will study the impacts and any mitigation that is appropriate through the design of the project. What would property owner Michael Schlesinger's involvement be in the development? Mr. Schlesinger does not have any involvement in this project, publicly or behind the scenes. I’ve never met him, talked to him, or sent or received an email from him. The option was negotiated for me by a broker. Mr. Schlesinger will only regain control of the property if the Poway residents vote no on this project. Will a specific plan be presented to the City of Poway for approval prior to the measure going to a rezoning vote? Yes. The entire process will be public. Will you collect signatures to qualify for a ballot measure or directly seek council approval? We plan on the City Council, if they approve the project, putting this on the ballot. If we decide to get signatures they will only be a sign of support not collected by paid gatherers. My partners and I may come knocking at your door to keep communication open and rally support. If the measure is approved, what assurances will the public have that more development will not be requested in the future? The project will be processed under a specific plan which is the mechanism used to prevent any increase in density or intensity. This means that the project the City Council approves, will be the project that the City residents vote on, and will not be subject to any change through a future Prop FF vote. When do you expect this to go to the ballot for a public vote? November 2020. The GVCA supports the City's initiative to get this property cleaned up. Show your support by letting City Council know by speaking at Tuesday's 7pm council meeting or by emailing council members regarding agenda item 3.5. The owner of StoneRidge has contracted with a tree company to dig up, remove and sell trees located on the former golf course. 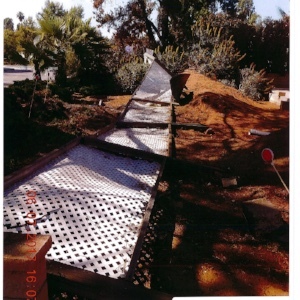 The GVCA has discussed the situation with City representatives and have been told that the owner is permitted to remove trees without a permit as long as they are not listed as a City of Poway "Heritage Tree" or native trees such as Canyon Live Oak, Coast Live Oak, Englemann Oak, and California Sycamore. The City is monitoring the situation and if any trees require a permit the City's approval will be required. We also have been told by council members that there is no movement at this time to revise the municipal code on trees in direct response to current activity at this specific property. The City has received several inquiries regarding the planned removal of trees at Stoneridge Country Club, as well as requests for the City to take action to address the removal. The Poway Municipal Code Chapter 12.32 addresses tree removal on private property. Since Stoneridge Country Club is private property, the owner is permitted to remove trees without a permit so long as they are not native trees or heritage trees. Essentially, native trees are oaks and sycamores. To the City’s knowledge, the trees in question are eucalyptus and pine. City staff has made the property owner and the nursery aware of the restrictions around native trees. If the trees were located in a public right-of-way, then a tree removal permit would be required. Again, it is the City’s understanding that the trees in question are not in the public right-of-way. The property is zoned OS-R (not commercial) and the property is vacant, without an active operation of any kind. Therefore, a tree removal permit is not required under section 12.32.150. Following the November 2017 election, the property owner terminated water service to the property. Therefore, the trees are not being watered and the City cannot compel the property owner to irrigate the property. Driving along Espola Road over the last few years, have you grown dismayed at the deterioration of the landscaping along the road, as well as other key roads (known as Landscape Maintenance Districts) in the community? The City is proposing to increase taxes with the promise of updated landscaping in these areas. A Landscape Maintenance District, or LMD, is an area identified to provide benefitting property owners the option to pay for enhanced landscaping and other improvements, and services beyond those generally provided by the City. There are ten LMDs in Poway. The LMDs were formed in the 1980s when many of Poway’s neighborhoods were first being developed. They cover the cost of contract labor for tree trimming, gardening, litter control, weed abatement and other upkeep and general maintenance (above baseline services provided by the City), as well as costs for water and electricity. LMDs are funded through an assessment on annual property tax bills. The assessment rates, which can vary by zones and LMDs, have remained unchanged for decades. Unfortunately, the funds being collected through the assessment are no longer sufficient to adequately maintain some of the City’s LMDs. The City is addressing two LMDs this year: 83-1 and 86-1. LMD 83-1 encompasses the Arbolitos, Twin Peak/Kindercare, Kent eld Estates, Diroma Estates, Kent Hill, Country Creek, Rio Court, Park Village, Midland Estates, and Poway 16 neighborhoods/ subdivisions. LMD 86-1 includes Bridlewood, Old Coach, Piedmont Park, Stone Canyon Ranch, The Grove and Vision, Huntington Gate, Serenata and Green Valley Estates. The City has taken short-term measures to reduce landscape services and watering schedules to minimize costs in each LMD. Over time, natural deterioration has affected irrigation systems, trees, plants and other landscape features. As the City plans for the long-term, it will invite property owners within each LMD to meetings to discuss how the funding shortfall and maintenance needs can be addressed. The LMD funding shortfalls leave the City and affected property owners with two options. The first option is to further reduce the maintenance services provided so that expenses are in line with revenues. While this is possible, the City is concerned about the poor appearance that will result from further reducing maintenance services. The second option is for property owners to approve a new re-engineered LMD (referred to as 18-1 and 18-2 respectively) with revised assessments, including an annual index (CPI) to ensure that future assessments keep pace with inflationary cost adjustments. The City held informational meetings with LMD 83-1 owners in November. Staff will invite LMD 86-1 property owners to participate in informational meetings in January. These informational meetings precede a ballot that will be mailed in March 2018 with options for the future upkeep of landscaping along main roads, neighborhood entryways and common areas within each LMD. Ballots will include an option to vote to increase the assessment rate, which will include an annual CPI index, to restore and improve service levels and reinvest in landscaping and maintenance. The outcome will be determined by the majority of the ballots received.